Simon Harwood is sacked from the Met for gross misconduct. Dalston is a "hotbed of illicit meat activity", according to the BBC, who report that illegal rat meat is on sale. Boris hires consultants to look into the future of Heathrow, should his Thames airport to be built. Ever wondered what happens to all the mud from the Crossrail dig? It's being turned into a nature reserve. The Olympic canal boat service, set to sail on through legacy, sinks dramatically. Shepherd's Bush Empire is plagued by pickpockets. Tory Assembly members not so vocal in support of gay marriage, contrary to Boris's views. Could the Olympic Media Centre be used as a temporary home for Parliament? 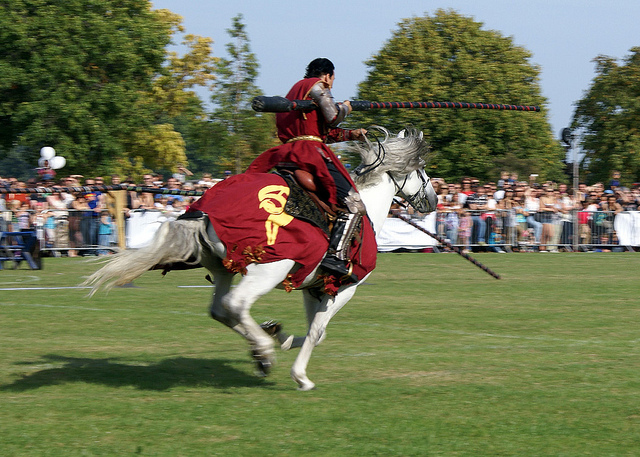 Joust at yesterday's Lambeth Country Fair by Markstravelphotos in the Londonist Flickr pool.